The illegal goldmining problem: "Artisanal" goldmining as it is known is practiced in the Amazon by miners who often enter indigenous territories and other protected areas illegally in search of gold. Soil is flushed from river and stream banks with large hoses and gold particles are separated using mercury. This activity destroys watersheds and left unimpeded, will introduce social ills such as alcoholism and prostitution to indigenous communities. The expedition, which took just under two weeks, also led to an encounter with illegal fisherman. Non-violent means were used to negotiate with them and put a stop to their fishing activities. Equipment was confiscated, adding further to the deterrence effect. The Expedition: On July 24th, the Kayapo headed out in five boats with over 600 litres of gasoline, some food and a battery and solar powered communications radio. They descended the Curua river, clearing a path of natural obstacles along the way. In two days they managed to travel 218 km and reach the access point to a trail leading 18 km through forest to the goldminers' clandestine airstrip and main camp. The group experienced much hardship from thirst on this trek as July is the dry season and forest streams are dry. Finally, late on the third day, they reached their destination. The Take-down: The goldminers had been tipped off over the radio by their contacts in Novo Progresso about the impending Kayapo surveillance operation and several had left the area. However, the Kayapo apprehended ten goldminers and confiscated and burned their materials and equipment. 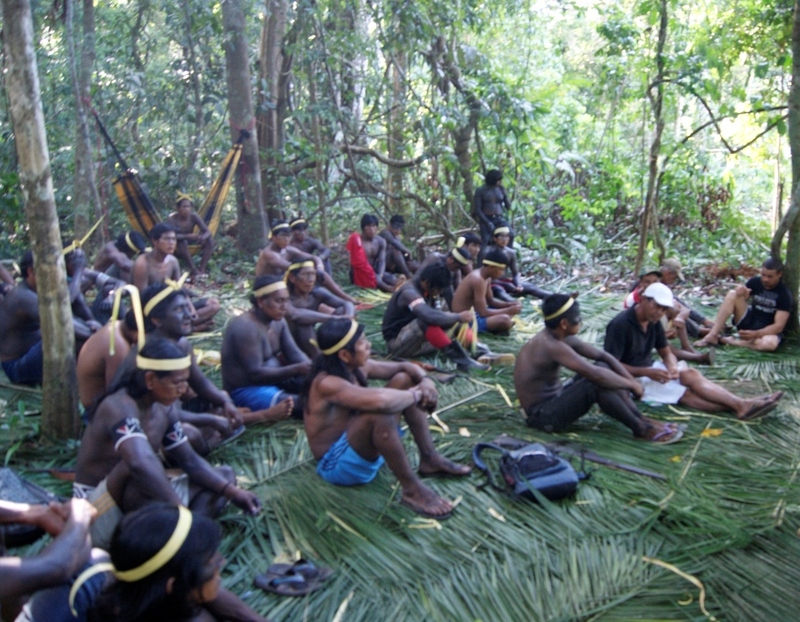 The Kayapo explained to the goldminers that they would not tolerate goldmining in their territory and would countenance only sustainable, non-predatory activities on their land. Three days later, the Ministry of the Environment finally arrived by helicopter to remove the gold-miners and fly them back to Novo Progresso to face charges. August 2: "This was the hardest day our our journey. We left camp at 7:30 a.m. and climbed many hills with heavy packs of supplies and food. There were no more batteries for the GPS, so we had to guide ourselves. Having not arrived to Pista Nova, we instead camped in the woods." August 3: "The group that we had lost in the hills on Friday afternoon finally arrived and all were exhausted. We gave them updates on our activities and fed them the little farinha and game we had left. I believe that this great eviction operation in Baú Indigenous Land is coming to an end." August 4: "Today was spent in a collective effort to clear the runway for our flight. Tomorrow several planes will arrive to return everyone to Baú village." August 6: "Staff withdrew from the area. We finally completed a full inspection of Baú Indigenous Land, after what will go down in Kayapó history as a great eviction operation in indigenous land with much determination from all those present."